Article first published on SeOppi 2/2017. I remember how I, a study advisor, walked the hallways of my university of applied sciences when the semester break approached and looked for certain students, my lost sheep. The tools with which I could have found the possible drop-outs were not many. In practice, I was relying on my eyesight, looking for and hoping to encounter students whom I did not think I had seen at school recently. I mingled and asked teachers and students if they had seen this or that other student. Universities of applied sciences do not enforce compulsory attendance, and it was only that I was worried about certain students and did not think everything was in order, fearing that they might be at risk of dropping out. There is a holistic model underlying this sort of a caring counselling culture. It means that we are genuinely interested in every single student. I find it particularly important that we detect potential drop-outs as early as possible. Study advisors monitor the progress of students’ studies. In earlier times, students, teachers and advisors met face to face in classrooms and hallways, but now that teaching takes place online, advisory work takes place online as well, and learning analytics is the advisors’ new tool. The learning analytics system collects data and is able to provide the study advisors with weekly reports concerning students who did not log in or logged in only worryingly few times to the Moodle learning platform. We know that goal-oriented studies require several logins per week. Therefore, alarm bells ring weekly, and the study advisors are notified of the possibility that certain students may be in danger of dropping out. In this way, the study advisors have the chance to act pre-emptively. Now that guidance has gone online, study advisors’ tools include e.g. email, Skype, WebEx, chat, WhatsApp and Snapchat. They are what the advisor will use to reach a certain student. A study advisor’s work involves a great deal of counselling and passing on sufficient and correct information. They introduce various options and assess the impacts of these options on the current points of interest. The idea is for such guidance to help students in decision making; however, study advisors are not providers of services intended to solve problems on behalf of the students themselves (Onnismaa 2007, 23-25). Helander, J. & Kemppi, J. 2006. Jos meijät on istutettu tänne jotaki tarkotusta varte: puheenvuoroja hämeenlinnalaisten nuorten osallisuudesta ja hyvästä [If we’ve been made to sit in here for some purpose: contributions to a discussion concerning the possibilities for participation and good life for Hämeenlinna youth]. HAMK University of Applied Sciences. Onnismaa, J. 2007. Ohjaus- ja neuvontatyö: aikaa, huomiota ja kunnioitusta [Counselling and guidance work: time, attention and respect]. Gaudeamus. Vuorinen, R. & Virolainen, M. 2017. Editorial. Opinto- ja HOPS-ohjauksesta urasuunnittelutaitojen vahvistamiseen ja ohjauspalveluiden laadun arviointiin [From advising about studies and study planning to improving career planning skills and assessing the quality of counselling services]. Journal of Professional and Vocational Education. 19 (2), 7. 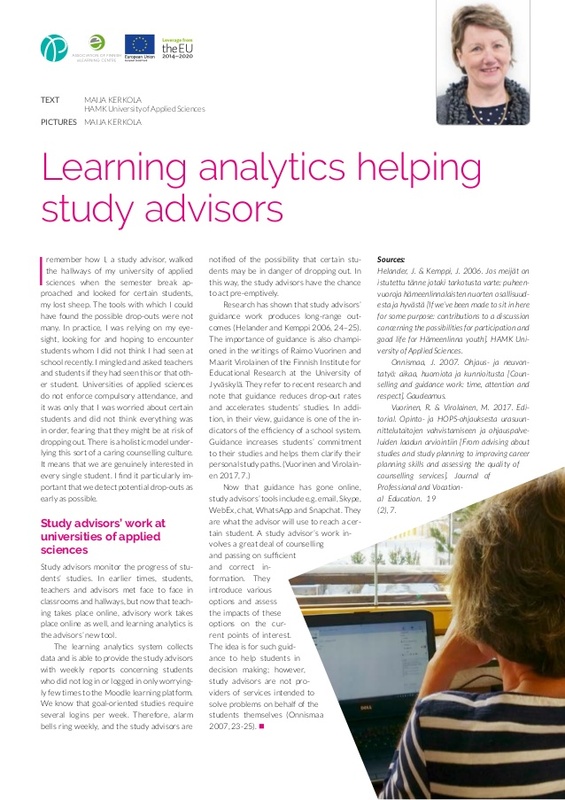 Learning analytics is becoming very popular in student administration. Study performance and students in danger of dropping out can be monitored. If a student’s activity level decreases at some point during the school year, the monitoring of only grades and courses passed would reveal this, in the worst case, as late as the following year. Our study monitored weekly logins to the learning platform. In the fall of 2016, the Adaptable Learning Paths project at HAMK University of Applied Sciences constructed a system that monitors students’ weekly logins and sends the study advisor weekly messages about students with reduced login rates. The target group was initially the students of computer sciences, but other students were included later. In computer studies, if a student is to drop out, it most often takes place during the first year, or, alternatively, the student is not able to complete his or her final thesis at the end of the studies. The early detection of the potential drop-outs among first-year students is very important. The thesis process was modified in 2017 to structure it so that it would not be easy to leave it incomplete. In computer sciences, the learning platform Moodle is in active use. Moodle is in frequent use in all studies during the first two years, and in practice, students must log in daily or almost daily. The algorithms we developed are based on this fact. The standard working day at HAMK consists of two parts separated by the lunch break. It is natural to think that students would log in to Moodle at least twice each day, achieving a minimum of 10 logins per week. However, students are required to complete a great deal of group work and one group member may submit the work of all others as well. This may lower the login frequency of group members even if they are active in their studies. Monitoring weekly logins, we first put the threshold at four logins. We thought it a logical conclusion that if a student logs in to Moodle only 0 – 3 times a week, all cannot be well. Later, we tentatively raised the threshold to eight logins and noticed we obtained a great deal of data concerning students who were doing just fine. We then lowered the threshold to six. That gave us a smaller quantity of data in emails, which was easier to manage. It is likely that we will study further the appropriateness of this threshold as well. We applied the same threshold in our monitoring of the activity of online evening students and observed that the same value does not function properly. For example, we set the threshold at six for the last week of September, and the system generated alarms concerning 24 students. Of these students, only five had zero logins and eleven had 3 – 5 logins. We saw a clear difference between evening students and daytime students: evening students do more during one online session. The upcoming Data Protection Regulation will bring challenges to the use of learning analytics. Any list containing names of students can be classified as a personal data register – and this is in essence what the weekly email from the learning analytics system entails. The view has been proposed that analytics could be used if they do not impact any single student. However, the whole point of this analytics is that the study advisor be able to contact a single student and to do this easily. In addition, the system profiles students. We must give thought to how we make the system work in compliance with the regulation so that we may continue to support students who are encountering difficulties. 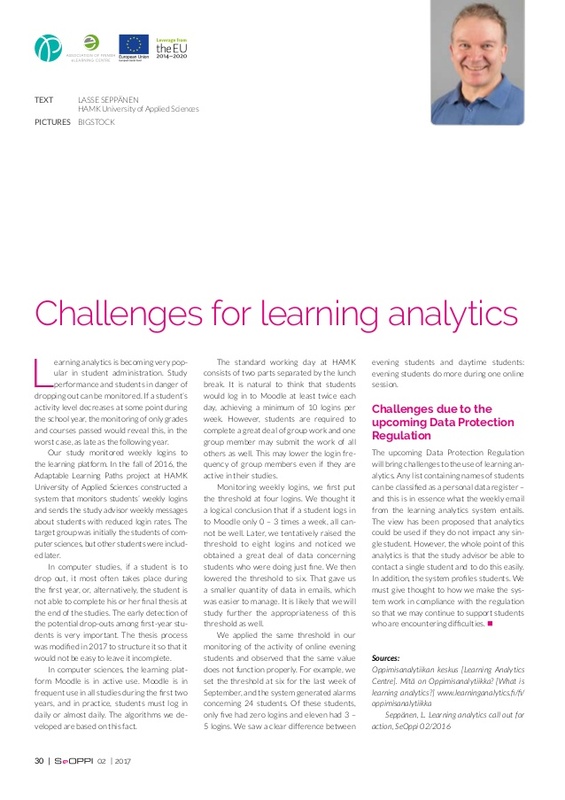 Learning analytics is becoming a popular function in learning management. Learning analytics targets a multitude of matters such as tracking course evaluations and students’ progress in their courses as well as even monitoring potential drop-out students. This presentation deals with the monitoring of potential drop-outs. Can we detect them from their LMS data before they actually leave? The study we report in this presentation is being performed at Häme University of Applied Sciences (HAMK). The target group is the first year students in the Degree Programme in Business Information Technology (Business IT). Annually, the intake is tens of students to both daytime and online studies. We can estimate that about 10 students will leave during or after their first year or later, particularly when they find it difficult to complete their theses. It would be important to learn if there were possibilities for helping the first year students and thus preventing the interruption of their studies. In Business IT, Moodle LMS is in heavy use. That fact forms the background for the algorithms that we created during this study. The use of Moodle should be constant during the first two years of studies. Moodle is used in every course, and students cannot perform well if they do not use it every day. An academic year at HAMK is divided into four periods of eight weeks. Each school day is divided into two sections: 8:45-12:00 and 12:45-16:00 with lunch in between. It would be natural to think that the students would log in into Moodle at least twice a day, making the total number of their logins 10 per week per person. But the students do quite a lot of group work and it is possible that they follow their peers’ work in Moodle. It is the school custom that one student returns the group tasks on behalf of the whole group. This could lower the login frequency even if the students are appropriately active in their schoolwork. For the purposes of this study, we selected a threshold value of four weekly logins. We consider this selection a logical one as we know that if a student logs in into Moodle only 0-3 times a week, there is something wrong. That student would be logging in into Moodle for only 30% of studies or less. The reduction of a student’s activity level during studies would be detected much later in a traditional environment. In the worst case, a student having dropped out might be detected only the following year when the student failed to enroll for the year. In our study, we monitor the first-year daytime students’ logins into Moodle on a weekly basis. The study was started by analyzing the data of the first year students in 2014. We were able to construct an algorithm and methods that gave us reliable results: we could pinpoint all students at the end of November who would later interrupt their studies. Some students continued their studies past Christmas, but dropped out eventually. The algorithm also detected a student who had taken an unauthorized one-week holiday in Greece. We have built a login follow-up system during autumn 2016. It sends weekly reports of students with a low login rate to the student counsellor. The system is being introduced as this article is being written. We will make more information available later. Our society is becoming more and more complex. Different issues interconnect in a more complicated way, and in general, seeing cause and effect relationships is more troublesome than earlier. One of the recent solutions to aid us to see totalities is the visualisation of the interconnection points of issues. Over the past few years, we have seen the emergence of info graphics, which makes complex totalities easily understandable; these include matters such as a certain phenomenon in the different countries on our globe, and the ecosystem of mobile devices and applications. Different monitoring and visualisation methods have long been a daily matter for those who work in technical maintenance jobs. These methods help us make sense of the totality we are studying while we also see e.g. individual users and their real-time behaviour. This allows us to make estimations and prepare for unexpected events, and we may monitor e.g. budget adherence. Mobile fitness applications such as Endomondo and Moves are examples of data visualisation in a regular person’s daily life. Such visualisations help us see our progress towards our goals, and we may study the speed of our progress as well as its tenability. The Adaptable Learning Paths Consortium (Poluttamo), funded by the European Social Fund, aims at constructing fluent transitions from studies to working life as well as working life to studies, and combining these in different ways. A key role in this work is given to students’ personal learning paths and the respective guidance activities. A new national core curriculum was introduced in Finland in 2016 for upper secondary education and basic education; one of the dimensions of this curriculum is the personal learning plan, which is required to be even more diverse than before. The Adaptable Learning Paths project is developing visualised personal learning plans (acronym VOPS) to support student guidance activities. The schools participating in the project are of various kinds and the studies they offer are not similar. Personal learning plans can be made visual from many perspectives: starting studies, planning studies, the progress of studies, alternative learning paths, what professions and further educations the studies make possible. Otava Folk High School is developing its visual personal learning plan format mainly to serve online students at the Nettilukio online high school. Nettilukio online high school is an upper secondary school for adults and it operates totally online except for the matriculation examination. Adaptable Learning Paths are currently developing several visual personal learning plan formats. We will see one of them in this presentation. Otava Folk High School is presenting the first developer version of the software at the Online Educa Berlin 2016. The design of the software is carried out by online counsellors Saara Kotkaranta and Anna Harmaa and concept and usability designer Kari A. Hintikka. Most of the students at Otava Folk High School are distance learners. The interaction between a student and the online counsellor takes place mainly through the internet. The software helps them form a clear, common basis for their discussions on the current situation and the way forward. At the beginning of their studies, students complete background information forms. They let the school know which level mathematics they intend to undertake, which languages they intend to study, whether their only goal is to gain an upper secondary education and pass the matriculation examination, and if they have prior studies that could be accredited. These selections form the basis for their visual personal learning plans. The visualised learning paths tailor themselves automatically to show only those issues that are relevant for the respective students. For example, students’ language selections keep their progress views from containing extra languages or courses. Naturally, selections may be changed during studies. Upper secondary studies can be classified in several ways. At the national level, they may be compulsory, optional or supplementary. Students may enter diverse information: objectives at different levels, courses they must take, courses they would find interesting, and courses that would benefit them regarding their further education. Different colours help students see at a quick glance their accomplishments and the courses they have completed. Considering students with sensory impairments, the Otava Folk High School visual personal learning plan system will include symbols in different shapes in addition to those in colours. When studies commence, students see their progress in units of different colours and shapes. The first developer version of the software focuses on the progress of individual courses, but if students ask, they can be offered diverse data visualised similarly to mobile fitness applications. Students might be shown, for example, their weekly or monthly study cycles such as the times of day they typically study, on which days of the week they study, and for how long they do so. Students could set target times for themselves, and the system could inform them of their progress similarly to fitness applications. Creating these solutions, we must note that seeing one’s progress in studies easily does not necessarily encourage all students – for some, the case may be the opposite. Therefore, these solutions are designed to support personal learning paths and the freedom of choice. On the other hand, online counsellors are able to draw a large number of conclusions concerning students’ upcoming progress by analysing their study data. The data can be compared to that of other students and previous students, and all this can be made more visual than the traditional lists used for statistics. When students’ studies progress, the system enters the next phase, which is that of completing secondary education and/or taking the matriculation examination. At this time, the system helps students’ time and work planning. The focus areas of the European Social Fund include fluent transfers during the programme period until 2020. 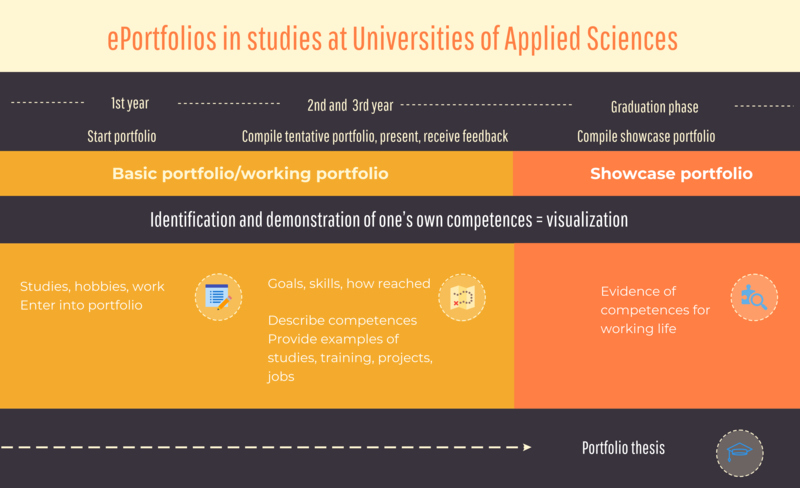 The visual personal learning plan system could be applied to making diverse models for students’ further studies and career options. Finland currently funds an online service called Studyinfo.fi, which is maintained by the Finnish National Board of Education. Finnish schools and universities maintain data of their educational programmes in the service. People may browse the site to learn about different professions and degrees and about the places where these degrees may be taken; they may also learn about the entry criteria and apply for programmes. Studyinfo.fi offers an open application programming interface. It would be possible to use the Studyinfo.fi interface to compare automatically, in real time, the courses completed and planned by a student to the entry criteria required by the educational programmes in the field of that student’s choice. 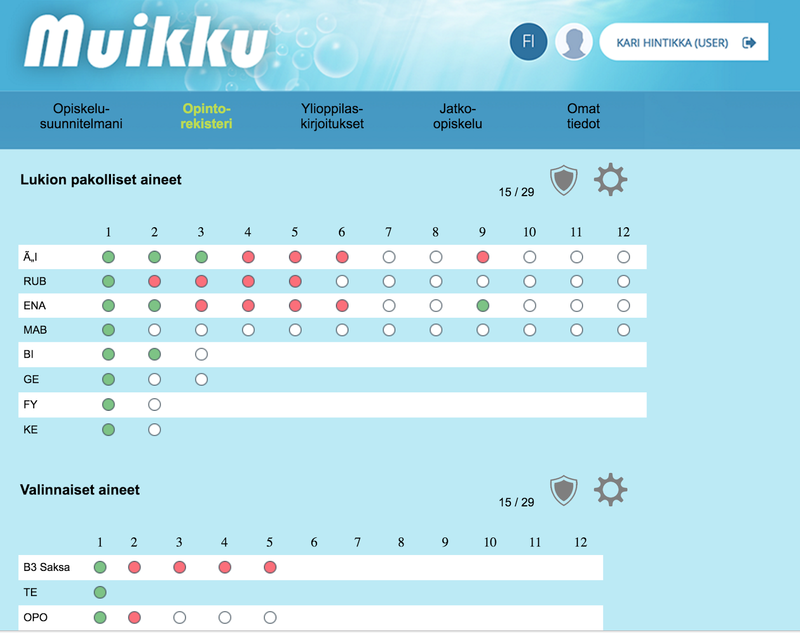 With the visual personal learning plan system and Studyinfo.fi interfacing, students could see what is required of them in order for them to apply for a certain educational programme and a certain school. With a dynamic visual personal learning plan system such as ours, students and counsellors could together guide students’ personal learning paths into the desired directions, making personal roadmaps to guide studies. According to WHO (2015) about 15% of the world’s population or one in seven people with disability. This means more than 1000 million people with disability globally, and of those around 80 million people in the EU. People with disability face widespread barriers in accessing services such as education, employment, and social services. The bricks these barriers are built of are diverse: for example inadequate legislation, problems with delivery of services, a lack of awareness and understanding about disability, negative attitudes and discrimination, a lack of accessibility. Huge positive changes are currently taking place in Europe and in the world concerning general legal and human rights issues. The United Nation Convention on the Rights of Persons with Disabilities has been revised, the WHO Global Disability Action Plan 2014-2021 and the European Disability Strategy 2010-2020 have been set in action (Figure 1). All these official documents put pressure on all parties to carry out actions that contribute to the realisation of equal rights on education and training, work and employment as well as accessibility on the whole. Figure 1. Legal and human rights set the table for multimodality and acccessibility. Educational equity does not sufficiently materialise for those with learning difficulties and different abilities. Specific barriers exist that hinder persons with disabilities from expressing their opinions as well as seeking, receiving and imparting information on an equal basis with others and through their chosen means of communication. People struggle with written texts because of their special needs in reading or writing skills, or due to their sensory deficits. In the case of people with special needs, people with different abilities and people with immigrant backgrounds, we face the question of accessibility and equality in issues that deal with written language. In addition to individuals with special needs, a growing number of young people are reluctant to read and write long texts, stories or books. In their case we see the cultural and social change in our society. These findings challenge current education. Reading and writing skills have always been seen as the educational corner stones of our western society and values. Current cultural, technological and social changes shake this dominance and challenge us to think about the role of reading and writing in education, in working life and in society in general. Could we address some learning difficulties, foster educational equity and prepare a new kind of citizenship by making our society and information more accessible by widening traditional ways of understanding, creating and sharing information, creating new knowledge and setting frames for working life with multimodality, multimodal interaction and digital literacy? As the digital revolution shakes society and its structures in many ways, could it also have positive side-effects as increasing accessibility for society? The European Parliament has enacted legislation EN 301549:2015, in which it defines accessibility requirements suitable for public procurement of ICT and services in Europe. The purpose of this legislation is to ensure that everyone has the same opportunity to enjoy the benefits of the internet and mobile apps, to participate in society to a fuller extent and to lead a more independent life. The directive covers websites and mobile apps of public sector bodies. It refers to standards to make websites and mobile apps more accessible. This directive has put great pressure on large ICT-companies such as Google, Microsoft and Apple to issue accessibility features for their products, including computers, tablets, mobile apps, software, cloud tools etc. These new accessibility improvements will ensure that there are many more possibilities to meet current educational challenges and provide access for those who previously were denied access because of their disability or different ability. Current ICT and mobile tools set the table for multimodal communication with accessible courseware, learning tools, learning environments, learning tasks and assignments, and ePortfolios (Figure 1). 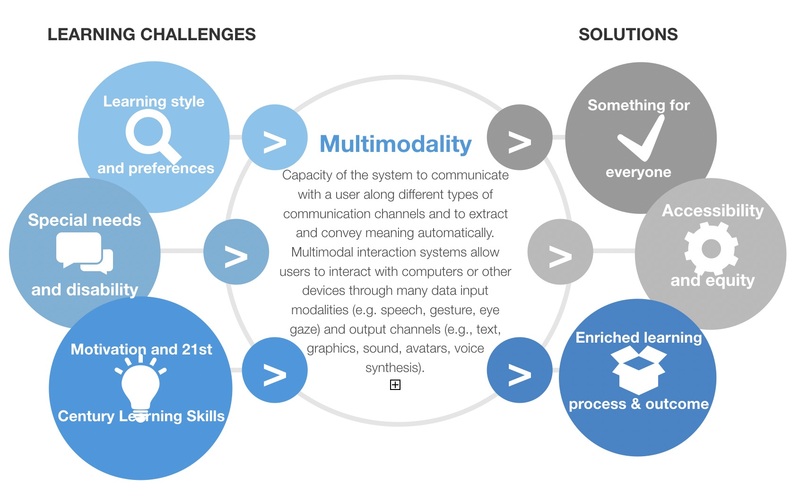 Multimodality is defined as the capacity of the system to communicate with a user along different types of communication channels and to extract and convey meaning automatically. Communication mode refers to the communication model used by two different entities to interact. Multimodal interaction systems allow users to interact with computers or other devices through many data input modalities (e.g. speech, gesture, eye gaze) and output channels (e.g., text, graphics, sound, avatars, voice synthesis). The multimodality core is intertwined with digital technology. Multimodality can enrich the learning process, make some tasks easier and information accessible for us all while it helps people with different learning styles, special needs, learning difficulties and disabilities (Figure 2). In many cases digital technology can make things possible that were previously impossible. Thus, multimodality is the extension of digital technology into new modalities of interaction that make new possibilities viable. Figure 2. Transforming learning experiences with multimodality. In this OEB Roundtable, Multimodality and Learning, it will be especially interesting to learn how the use of multimodality and multimodal interaction has been met internationally. 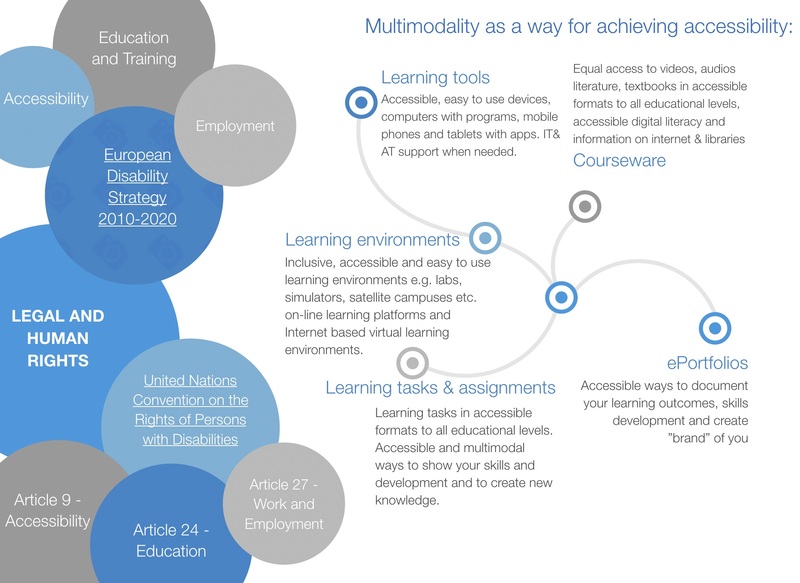 What kinds of multimodal solutions have been developed for accessibility for various stages of the learning process and for the transition period from upper secondary education to higher education or to the labour market. It will be great to hear, what other participants have found around this area. Accessibility requirements suitable for public procurement of ICT products and services in Europe. EN 301549: 2015. http://www.etsi.org/deliver/etsi_en/301500_301599/301549/01.01.02_60/en_301549v010102p.pdf (October, 10th, 2016). European Disability Strategy 2010-2020. http://eur-lex.europa.eu/legal-content/EN/TXT/?uri=URISERV%3Aem0047 (October, 10th, 2016). United Nation Convention on the Rights of Persons with Disabilities. http://www.un.org/disabilities/documents/convention/convoptprot-e.pdf (October, 10th, 2016). WHO Global Disability Action Plan 2014-2021. Better health for people with disability. World Health Organization. 2015. http://www.who.int/disabilities/actionplan/en/ (October, 10th, 2016).